Is a thousand years enough for forever? When you’re 16 years old, the future seems some far away. So, it’s not surprising that this group can’t adequately comprehend that all their talk about forever is just that: talk. As I had speculated in the last episode, I don’t think that all these promises being made that reference to forever or eternity will actually come to fruition. Luckily, I don’t have to be the one to give them this harsh reality check. The future can handle that one just fine by itself. Chen Xun and those random dudes are fighting in some alleyway after one of the guys refused to apologize to Fang Hui after bumping into her. It’s clear that Chen Xun is losing this fight as he’s on the ground getting kicked over and over again. But Qiao Ran to the rescue! He appears out of nowhere and joins the fight. Together with Chen Xun, they successfully fend off those thugs. Bro power! The Three Amigos are hanging out, bored until they hear talk on the TV about Y2K. How 1999! Qiao Ran asks Chen Xun what he’d want to do if it really was the end of the world. He says something stupid about defeating level 8 of some video game. Meanwhile, Jia Mo and Fang Hui are also discussing their plans for the New Year. Jia Mo gives Fang Hui a cheesy card to give to Chen Xun and tells her to write stuff like, “I love you forever,” on it. Fang Hui says who knows if there’s really a forever since it might really be the end of the world at the end of the year. That level 8 must be mad tricky. The group is looking at the school bulletin board to see their exam scores/class assignment. Fang Hui is slightly sad because Chen Xun isn’t going to be in the same class as her. But Qiao Ran is! They then try to be all sly and secretly hold hands, but Zhao Ye sees them and starts freaking out. He thinks he just uncovered some scandalous relationship, but Qiao Ran and Jia Mo are barely reacting because they already knew, duh. Zhao Ye and Chen Xun are playing video games when Zhao Ye asks for the details about him and Fang Hui. Chen Xun knows that something must be up if he wants advice on girls, and he quickly guesses that the object of Zhao Ye’s affections is Jia Mo. When asked how he knew, Chen Xun says that pretty much everyone at school knows. Zhao Ye keeps asking for advice, and Chen Xun tells him to stop talking so much and play up that “quiet and cool” persona. 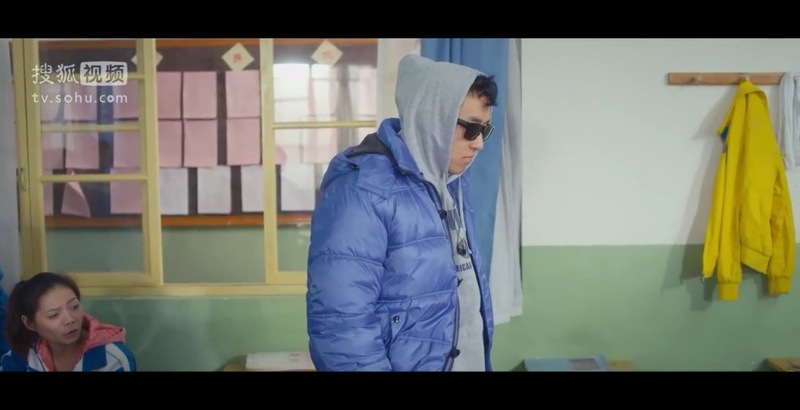 This only leads to Zhao Ye coming to school the next day in a hoodie and sunglasses. Too bad that he can’t see straight with his sunglasses on and only ends up looking like a fool. Way to give bad advice, Chen Xun. Chen Xun tells Fang Hui that Zhao Ye is finally going to pursue Jia Mo, and she doesn’t even believe that he’s being serious. Can you blame her? She says that there’s no way that Jia Mo will even say yes to him because he’s had so many crushes before and guys always value their first loves the most. Convo quickly turns to themselves when Fang Hui asks Chen Xun if she’s his first love. He says of course. She continues to ask if he’s ever had a crush on anyone else before her, and he says yes but quickly takes back his answer. Fang Hui asks who it was, and Chen Xun names one of his childhood friends, Wu Ting Ting. Fang Hui waits for Chen Xun to pick her up from school, but he never shows up. Eventually, she just leaves on her own. Turns out that Chen Xun is at the hospital because one of his childhood friends’ grandfather is in the hospital, and he rushed there to see him. Fang Hui calls Chen Xun at home to look for him but he’s not there. Where you at, Chen Xun? He apologizes the next day to Fang Hui for not being able to pick her up. When she asks why he wasn’t home when she called last night, Wu Ting Ting suddenly walks up to them. She’s here to give something back to Chen Xun that he had left with her last night. Fang Hui’s eyes are darting between the two of them and her mind is probably racing a million miles, trying to figure out what they were doing last night. Ting Ting then tells Chen Xun that they need someone at the hospital at all times to look after the grandfather, and Chen Xun quickly promises that he’ll be there. After she leaves, Chen Xun can tell that Fang Hui is upset. He tells her to not overthink things and that he’ll call her after school. Fang Hui clearly doesn’t take Chen Xun’s advice because that’s all she can think about during class. Qiao Ran notices how depressed she was acting, and finds her after class to give her his notes to copy. Nice and studious! He tries to get her to laugh with some lame joke, which apparently works…for like two seconds. Fang Hui asks him if there’s anyone he can’t seem to forget for his entire life. He replies the person he can’t forget is his father, who passed away when he was 13 years old. He tells her that he taught him before that if there are things that you don’t understand, stop thinking about them for awhile, and you’ll eventually understand. After her talk with Qiao Ran, Fang Hui finds a photo of herself with her dad that she had hid in a book. She whispers, “Happy Birthday,” to the picture. And literally the second she finishes saying it, her mom rips the picture out her hands and crumples it up. Where did she come from?! She tells Fang Hui that she can’t have any of this person’s stuff in their house. Fang Hui asks her mom if she has really forgotten all about him, and her mom replies that it’s him who has forgotten about them. Chen Xun calls her house at this very moment, Fang Hui’s mom picks up and says that she’s not home. Talk about bad timing. Jia Mo gives Su Kai a New Year’s card, but he doesn’t seem too enthusiastic about it. When she asks him if everything’s okay, he says that everything’s cool. She invites him to ring in the new year with her, Zhao Ye, and the rest of the basketball team, but he says that it depends on if he has to spend it with his girlfriend. Is there trouble in paradise for Su Kai and his girlfriend? Perhaps. The Three Amigos are watching a movie and the couple in it are making out and rolling around in a bed. Let’s just say that the boys are really into this movie. Lol. Zhao Ye asks Chen Xun what it’s like to kiss a girl and if he and Fang Hui ever kissed. Poor Qiao Ran feels awkward when they’re talking about this and gets up to walk away. He comes back though when he sees Zhao Ye practicing kissing on one of his action figures. Do teenage boys really do this…? Zhao Ye tells them that he thinks Jia Mo has seriously been mesmerized by him. Ha, keep dreaming. The boys are practicing a dance routine to Backstreet Boys’ “Everybody” but can’t seem to get the dance moves right. Zhao Ye asks Jia Mo, their choreographer, what the moves are, but she’s clearly not in the mood for any of this. While Zhao Ye is off dancing by himself and trying to impress her, Jia Mo just tells them to forget about it. Qiao Ran goes to find her after she leaves. She tells him that they don’t need to perform to that song anymore. Remember that this is supposedly Su Kai’s fave song. See the connection? Jia Mo asks Qiao Ran if there’s someone that he likes. If the person he likes doesn’t like him, what would he do? Ah, way to twist the knife! Qiao Ran tells her that if that’s the case (which it is), then he would secretly like her and secretly help her. Jia Mo says if everything is done in secrecy, then would the other person know? He says that wouldn’t matter if you really like the person because as long as you can help them, you’d be happy. Jia Mo disagrees and says that when she likes someone, she wants to become a part of that person’s life. Qiao Ran says that there are a lot of different ways to do that, such as being the air. She says that’s true, but even if she has to be air, she has to be the air that he can’t live without. Dang girl, you sure are determined to win over Su Kai. The Three Amigos put on a lively dance performance set to “YMCA” and is complete with super ’90s dance moves. Although Qiao Ran is pretty good with poppin’ and lockin’. Their performance confirmed for me that while the “YMCA” dance is most definitely lame, it’s also one of the most fun. While the dance party is still going on, Chen Xun and Qiao Ran pull Zhao Ye into a corner to ask him how he’s going to confess to Jia Mo later. When she interrupts their convo to ask what they’re talking about, Chen Xun helps Zhao Ye make up an excuse to have Jia Mo meet him in the basketball court after the party. At the basketball court, Zhao Ye is showing off his moves to Jia Mo. Sorry dude, they just aren’t that impressive. She asks him why he’s been acting so weird lately. He tries to confess but can’t get the words out properly. Instead, he tells her that they should exchange secrets about who they have a crush on. They each write the person’s name on a piece of paper and exchange them. When Zhao Ye reads that Jia Mo had written Su Kai on her paper, he flips out. 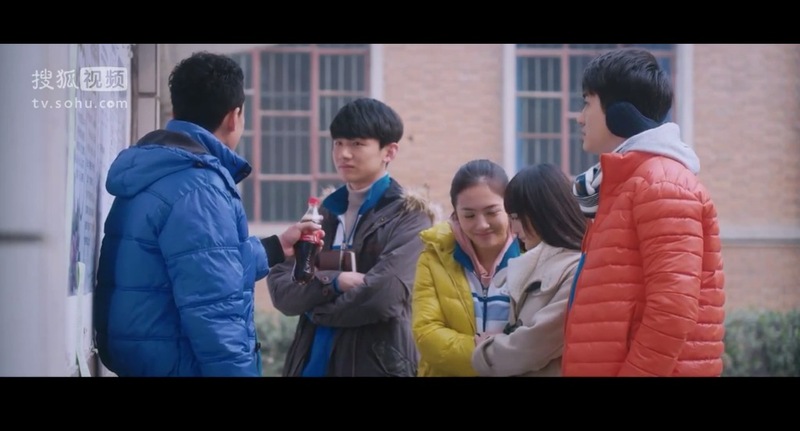 He tells her that he already has a girlfriend and that she can’t like him, but Jia Mo argues that she can like whoever she wants and it’s not like she’s doing anything to break them up. Zhao Ye gets so pissed that he…eats the paper. That’s one way to do it, I guess. Fang Hui and Chen Xun are on the rooftop of the school lighting sparklers. He pulls her in for a hug, and she asks him what if someone sees them. Chen Xun says it’d be even better if someone saw them because they could then be their marriage witnesses. Whoa, calm down there, Chen Xun. Fang Hui says pretty much the same thing but you know that she’s already thinking about her future as Mrs. Chen. Chen Xun says that he has no doubt that they’re going to go to college together, graduate and find jobs together, and then get married and have children. He wants Qiao Ran to be the best man (so cruel!) and Jia Mo to be the maid of honor. Fang Hui insists that it’s all too far in the future, but Chen Xun says that he knows for sure that this is how everything’s going to happen. Drama rules say the opposite will probably occur. When the clock strikes midnight, Chen Xun kisses Fang Hui. She immediately pulls away from him, and tells him that it’s her first kiss. He admits that it’s his first kiss too. He tries again and she doesn’t pull away this time, so that’s a good sign. Chen Xun’s voiceover says that “forever” is a very simple phrase, but it represents the most difficult promise to keep. I totally called it in the last episode! On this night, they all thought that once they enter the new millennium, they would be able to grasp onto forever. In reality, no one knows what forever means. No one knows where they will be in the next thousand years. During the basketball team’s New Year’s party, it’s Zhao Ye that gets wasted this time around. Jia Mo pulls out the paper that he had given her earlier, but hadn’t looked at properly. She sees her own name written down, meaning that the person Zhao Ye has a crush on is her. When she’s walking home with a drunk Zhao Ye, she thinks back to all the moments that they’ve had together. Is her heart starting to waver? Ting Ting’s first love was one of Chen Xun’s childhood friends, but he passed away in a car accident years ago. His grandfather is the one who is in the hospital, and that’s why Ting Ting feels so responsible for him. Fang Hui’s parents divorced a long time ago. By the looks of it, it was definitely not amicable. When Qiao Ran comes home from the New Year’s party, he sees that his mom is back from England. You do you, Zhao Ye.